This month’s Apex Magazine cover artist is Joe Badon, a freelance comic book artist from Slidell, Louisiana. His cover piece evokes a sense of mystery and a unique vision of reworking older works into new and interesting pieces. APEX MAGAZINE: Your cover piece for this month’s Apex Magazine, “Girl Skull Wing,” is a digital illustration that started with vintage public domain images. What it is about an old photo that jumps out at you, that sparks an interest in changing it? Are you typically looking to completely change the photo, or simply enhance it into a new reality of sorts? JOE BADON: I love the idea of nostalgia, and old photos trigger those emotions even if we’re not realizing it. Also, I love repurposing/recycling things. I definitely want to change the original photo as much as possible, to create something brand new. 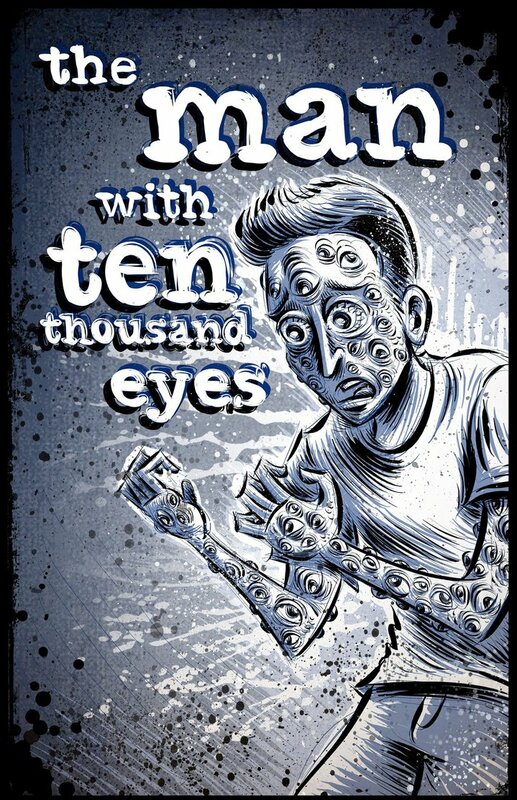 AM: The Kickstarter project for your surrealist comic, The Man with Ten Thousand Eyes, was very successful. Other than the funding itself, what was your takeaway from the whole process? Are there things you might have changed, or didn’t expect out of the process? JB: This will be my fourth or fifth Kickstarter. At this point, it’s fairly normal territory. One thing I’ve learned is that Kickstarter campaigns are A LOT of work and you have to prepare yourself for a month of full time/40 hours a week fundraising. 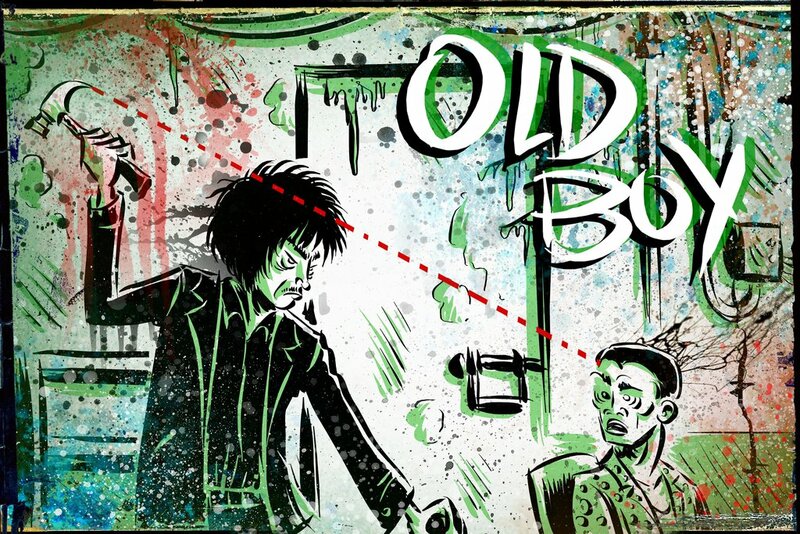 AM: When you are working with movie and pop culture images, such as your piece based on Oldboy, how much of the literal scene are you trying to capture, versus your interpretation of what happened onscreen? Do those images strike you as you are watching a film, thinking, “I just have to paint that”? JB: Basically, after having watched a movie that I’ve really loved, I’ll think about that one scene that really blew me away. I’ll then try to capture that moment in my own style. I’m definitely trying to capture the scene emotionally and artistically rather than realistically. AM: Your YouTube channel (https://www.youtube.com/user/joebadon) features interesting music, and seems well in tune with your style of art. Is creating music an extension of your visual style, or does it represent a fully different part of your creative side? JB: I think that my music and my art are both equal extensions of the same creative source. Since my music is more for my own enjoyment, I’ll create audibly for my own pleasure as opposed to my visual art which I usually will have a client or customer in mind. I usually keep my visual art on the more accessible side and my music on the more experimental side. Both my music and my art are influenced from the same sources though. Musicians such as John Zorn and Sufjan Stevens and artists such as Jackson Pollock and Marc Hansen influence my music and my visual art equally. The more you delve into an artist (whether that artist is an illustrator, painter, director, sculptor, musician or composer), you’ll find that each “artist” has an artistic philosophy that can be translated to any type of creative endeavor, visual, audible or otherwise. Pollock has a philosophy of “automatic painting” which can be translated into improvisational music or stream-of-consciousness writing. Sufjan has a philosophy of influence layering (taking different genres and musical ideas and layering them on top of one another) which is something that I try to achieve with my visual art. Also, I feel like I just need to be creative. If I wasn’t able to draw or play music then it would leak out somewhere. I’d probably be making paper crafts or toys or movies or noodle sculptures or something. It would have to spill out somehow. 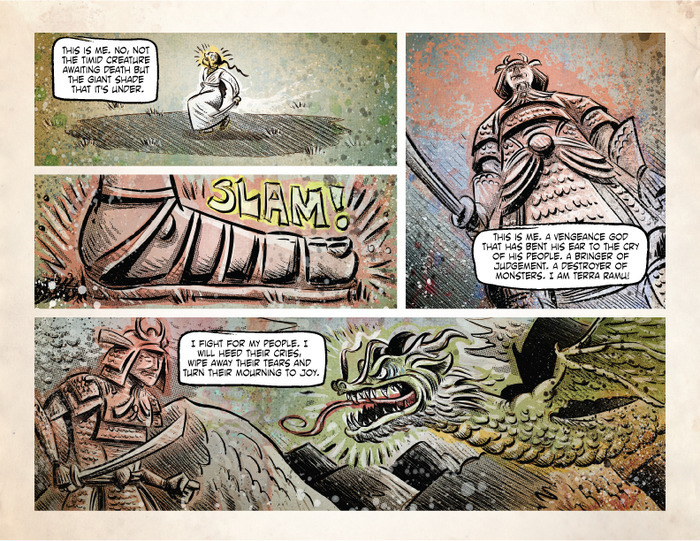 AM: In creating a comic like Terra Kaiju, how much of the comic is planned versus changing and adapting as you create it? Does the story get fleshed out first, or the art first, or do they evolve together? JB: I’m sure that I’m doing it all wrong, but when I’m create my own comics, this is how I usually work: I’ll write a quick outline of the story. I’ll then illustrate the comic based on that outline. Lastly, I’ll add words, dialogue and narration after the comic is fully illustrated. 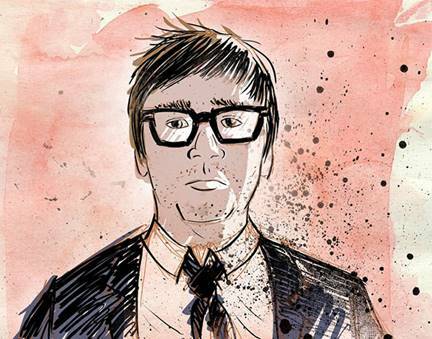 Joe Badon has been working as a full time freelance illustrator since 2009. He has worked on such comics as The Man with Ten Thousand Eyes, Terra Kaiju, Memoirs of the Mysterious, Frankenbabe and on many other commercial and private commissions. Visit his website at joebadon.blogspot.com, and listen to some of his music at thebandthatwouldntdie.bandcamp.com.